With a return to league action Bervie travelled to Aulton to face Byron Spurs with Gordon still out injured and Webster missing. Bervie started the match well showing some pace and a sense of urgency in moving the ball about on what was a small pitch. With McHardy imposing himself early on he made what was to be the first of many interceptions and feeding Anderson on the left, cutting back onto his right he found Blacklaw whose effort was well saved by the keeper. Next it was Collie to test the keeper, again finding him equal to the task. With Bervie dominating Smith did well to intercept a through ball and find McLaughlin who played in Montgomerie who found Blacklaw whose effort went just wide. Bervie were having all the play and again McHardy won the ball and found Collie who played the ball inside the full back for Anderson, his cross-found Blacklaw who teed up McLaughlin whose effort was again well saved. With Bervie dominating the home side were starting to get frustrated with their forward having his name taken by the referee following a coming together with Smith. However after so much possession it was the Byron who had the best chance, Leisk coming out to collect the ball only to have the forward beat him to it presenting him with an open goal however he managed to put his effort wide. Dusting themselves down Bervie created another chance following a Salmond throw which found Collie who turned smartly and fired another effort goal wards but again finding the keeper in fine form. The deadlock was broken by the home side though, when Bervie were unable to deal with a good free kick into the box which was nodded home at the back post. 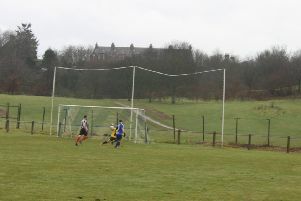 Montgomerie and McHardy were dominating the centre of the pitch and the former found McLaughlin whose cross found Collie whose effort was once again well saved. With the home keeper seemingly unbeatable it looked liked something special was going be needed and Bervie thought they had a penalty when Anderson held off a challenge to fire goal ward only the have the effort blocked by a blatant handball however no whistle was forthcoming despite the protests. With half time looming it was the home side who grabbed a second, Bervie unable to clear the ball from a throw saw the forward beat two and fire home at the near post to double the lead. The half time team talk was all about keeping calm and trusting their passing game, the chances were there and only some good goal keeping had prevented Bervie scoring. Bervie started the second half positively with Anderson winning the ball and feeding Collie down the left, his strong run got him into a goal scoring position only to be denied again by the keeper, McLaughlin was next to test the keeper again seeing his effort saved. The defence had to remain alert with a Byron’s wide man showing good pace, only a fine sliding challenge from Smith averted danger. Bervie finally broke the deadlock, McLaughlin controlling a goal kick and finding Collie through the middle who calmly cut back to beat his man and slot the ball home. This lifted Bervie further and Sawyer did well to win the ball at left back and find Anderson who again fed Collie who was once again denied by the keeper. The equaliser wasn’t long in coming though; from the corner Anderson flicked the ball on at the near post and it was only half cleared to Montgomerie who fired a fine effort home to draw Bervie level. With their tails up Bervie were dealt a blow when McLaughlin was withdrawn with a nasty ankle injury which will keep him out for sometime, however undeterred Bervie grabbed the lead, McHardy doing well to beat his man feeding Collie whose effort was blocked however Blacklaw was on hand to follow up and rifle home. Bervie were now absolutely dominant and grabbed a fourth when Salmond fed Avis down the right who fed Collie who confidently slotted his home his second of the game. Bervie killed the game with a fifth when Anderson won the ball on the left and found Blacklaw he calmly pulled the ball back for Montgomerie who fired home the final goal of the match. An excellent result for Bervie showing a real determination to come back from two goals down and not to let the physical nature of the match stifle their passing game, which in the end brought them the result they deserved.